Synopsis: In this stand-alone companion to the New York Times bestselling Daughter of Smoke & Bone series comes the story of Mik and Zuzana’s fantastical first date—as a gorgeously illustrated gift edition with bonus content included. Review: My dreams have finally come true, and they are so much better in real life than I could have ever of dreamt up myself!!!! Everyone who knows me (in fact they don’t even need to know me, they just have to mention books in passing) knows that I adore Laini Taylor’s writing. 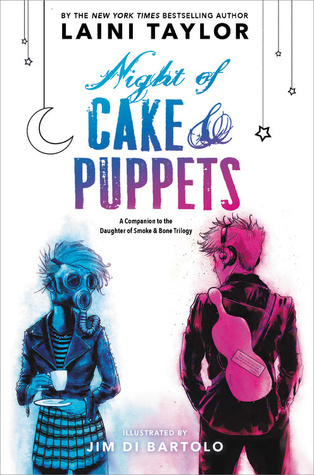 People who know me also know that I have been waiting for a print edition of Night of Cake and Puppets since 2013. Another thing people who know me know, is that I also adore Jim Di Bartolo’s art. And now it seems that Laini, Jim, Little Brown and Hodder have made me the perfect present: an illustrated print edition of Night of Cake and Puppets!!!!! Eeeeeeek!!!!!!!!!!!! So to talk about the perfect that is this book, I am breaking down my ramblings into four sections: overall review, story review, edition information and extra content. Overall Review: I could not have imagined the perfection of this book in my wildest dreams! I adore everything about it. I fell in love with this story when it was released as an e-novella in 2013 as I absolutely adored Zuzana and Mik throughout the Daughter of Smoke and Bone series. Back in 2013 I instantly ell in love with the story of their first date, but this book has made me fall in love all over again with the lovely paper pages and gorgeous illustrations! Jim has done this story, and Zuz and Mik, justice with his artwork throughout the book. We get to enjoy so many wonderful illustrations, including the most adorable couple in the world, Zuz and Mik, but we also get to enjoy so many aspects of this story such as puppets, cats, Prague, hearts, snowflakes and many more wonderful things :) Jim has captured the story, the location and these characters so well! We get to see varying styles of illustrations which I really enjoyed… and to be honest I would be hard pressed to name a favourite. I love the Prague stuff (naturally as it is my favourite city) but there are just so many pieces to love that I just can’t pick a favourite (which says a lot when I don’t instantly pick Prague). Basically, this book is perfect – I adore every bit of art included and I am just SO SO happy with how this book has turned out!!!!! Thank you Jim for making this magical story so much more magical! Story Review: Once again, Laini Taylor has blown my mind! Yes, Laini is the one author that will turn me into a fangirl, makes me gush and could easily turn me into that person who collects heart shaped rocks – but that is because she never fails to amaze and captivate me. And yes, she managed to make me fall in love, and then left me desperately wanting more after this 100 page novella. This astounding story explores the night that Zuzana and Mik went on their first date – well going on a date is a bit of an understatement, it was more an adventure. A treasure hunt to be precise. The story follows both Zuzana and Mik as they hike all over Prague in one night (yes, all over Prague… and yes I have noted the places for my visit there next year), all so Mik can seize his prize – Zuzana. I was utterly mesmorised from the first sentence, right up until the very end. I loved everything about it, the humour, the tenderness, the anxiety, Zuzana’s childhood stories, the glimpses of Karou, the memory of Kishmish – and even a cameo from Kaz (although, it is Kaz, and what’s to like about him?). The setting is idealistic, creating a somewhat eerie but yet beautiful backdrop to this one night where magic truly happens. In this awesome novella, we get to see more sides to our favourite rabid fairy and her violin boy. With humour that you would expect from Zuz, and sweetness that you would expect from Mik – this story also shows the more vulnerable and even more endearing side to them both. They truly are the cutest couple ever – and following both their POV’s during this one amazing night is just magical. Laini once again floored me with her amazing creativity, her beautiful and lyrical writing, and her ability to capture an essence and hand it to you while you are reading the wonderful words she has written. And her descriptions of Prague are once again astounding! Her ability to evoke such beautiful images from words is nothing short of amazing (and trust me, I’ve been to Prague, and she is spot on – and when I go back, I just know I am going to be disappointed that there is no Poison Kitchen). If there is one person in this world who’s mind I would like to live in, it has to be Laini’s – she is phenomenal; she is a great story-teller, she conjures beautiful visualisations, and she creates all the feels – oh the feels – so many feels! As amazing as Night of Cake and Puppets is (and it truly is), it has left me wanting even more of Laini’s writing. So yes, I utterly loved this unexpected (but highly appreciated) novella. I would love for Laini to give us more novellas – any novellas, all novellas, anything really! Preferably about Brimstone. Actually a book about Brimstone would be good – but I’m not greedy ;) But I know that may never happen, and I really do appreciate this adorable story that I never thought we would get to see – Thank you Laini for this amazing story about the Night of Cake and Puppets! Edition information: There are 3 english editions of this wonderful book, US hardcover, UK hardcover and international paperback. Below is a rough breakdown of each edition and images. US hardcover: This edition has a wonderfully colourful cover, but the real gem is hidden underneath the dust-jacket. Once you remove the jacket you will find one side of the spine pink and the other blue. But even that isn’t the best part – you will also find additional illustrations of Zuz and Mik here too! This edition even has some (color and themed) coordinated end papers. The one thing to note about this edition is it is not the same size as the Daughter of Smoke and Bone hardcovers. UK hardcover: Although the illustrations on the UK edition are the same, these are very different covers. This cover is naked (no dust-jacket) and instead of in colour, these illustrations are in luscious foil. My copy is still in the mail, however my friend’s has arrived and I can confirm that this edition is also a different size to the Daughter of Smoke and Bone hardcovers (and all UK and Aus paperbacks). International paperback: Yes, a paperback does exist. However it seems that you cannot buy it from anywhere at the moment. I was lucky enough to get one before they went missing off the interwebs. It is very similar of course to the US hardcover, without the naked awesomeness, and a slightly different back cover and no endpapers. This edition is the same size as the Daughter of Smoke and Bone paperbacks. Extra content: If you do not want to know about the extra content in this book, LOOK AWAY NOW!!!!! Okay, you should be gone now, so if you aren’t, I take no responsibility if you want it to be a surprise. Okay, so the extra content includes one of my all time favourite thing: the Daughter of Smoke and Bone graphic novel sampler. While I prefer this sampler in colour rather than black and white, I love the fact this is included in the book so that everyone can enjoy this artwork. Due to seeing this sampler years ago, I have long been a fan of the idea of a Daughter of Smoke and Bone graphic novel! Or a fully illustrated edition. Or anything that involves this artwork. Amongst other things, this amazing graphic sampler includes perfect (in my opinion) illustrations of some of our favourite characters including Brimstone (my love), Kishmish and Issa. It also includes my favourite Karou piece. I adore this interpretation of Karou… everything about it is perfect. And there is a sampler for Daughter of Smoke and Bone. But if you haven’t read this book yet, I ask why not? Run out and get it now!!!! If you don’t already have this illustrated book in your possession, I urge you to go out and get it now. You will not be disappointed in it’s perfection.